Lauren takes her business very seriously and it shows in her passion, love and understanding for the dogs, her outstanding grooming skills and her professional, reliable and responsible work ethics. 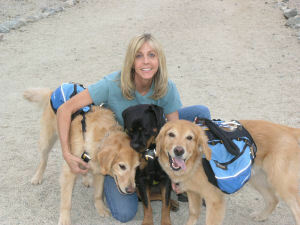 Her goal is to educate clients to take the best care possible of their dogs to live happy, healthy, balanced lives. She takes a lot of extra time with her clients to give them needed information about basic care, health concerns, breed specific issues and training advice because she truly cares about the dogs. Lauren treats all dogs as she would want someone to treat her own dogs. Lauren started her mobile grooming business in 2005, in La Quinta, CA, and then relocated to Boise, Idaho, in June of 2010. After enduring eight Boise winters Lauren decided to move back to the warm, sunny desert and chose Arizona to be near family. 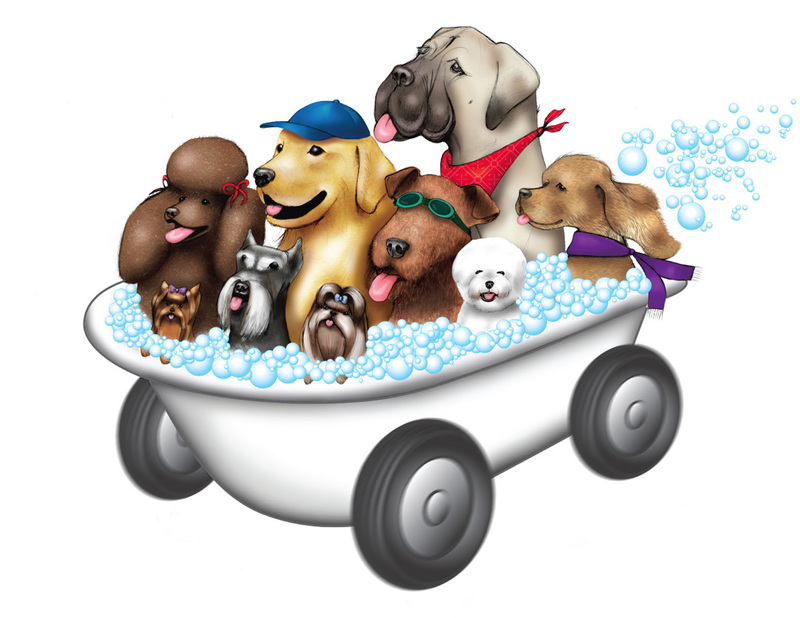 Club Doggie was voted "Best Grooming Salon" by "KTVB Seven's Best" of Boise 2013! When Lauren started Club Doggie Mobile Grooming Salon in La Quinta, CA, the business and client list quickly grew and her clients ranged from stay at home moms, busy professionals, jet-setting snowbirds, famous celebrities and even the former President Gerald Ford's dog. Lauren is proficient in all AKC breed standard cuts and specializes in pet trims and puppy cuts to make your dog look adorable!! 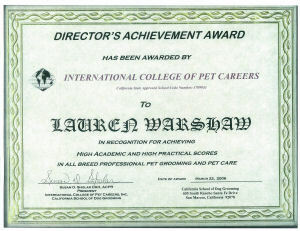 While living in both Boise and La Quinta, Lauren was highly recommended by local veterinarians and other pet businesses as well as being the preferred groomer for the world famous La Quinta Resort and Club. Lauren has written feature articles for "Bone Up!" Magazine, a dog health and well being magazine, www.boneupmagazine.com. Lauren was picked to be the first mobile dog groomer on the internationally famous TV show, the "DOG WHISPERER" with Cesar Millan. Cesar and his film crew came to La Quinta to shoot the hour long episode. Cesar rode around town with Lauren in her Club Doggie grooming van and went to a few client's homes who had difficult dogs and taught Lauren and their owners how to be better pack leaders. The episode aired on May 1, 2009, on the National Geographic Channel and is currently still in reruns and was voted the #3 most favorite episode by viewers. 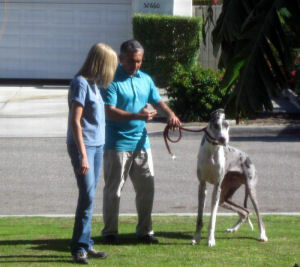 Above: Lauren, Cesar and Buster. Below: Lauren, Cesar and Jack. When not working, Lauren spends most of her time with her much loved, dogs. 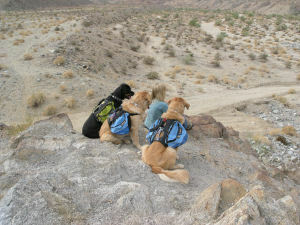 They enjoy hiking and doing doggie sports, training and other activities. Lauren is also an avid reader of dog books and magazines on training, health, nutrition, breed standards, dog psychology, behavior and more. Dog training is a strong focus for her. 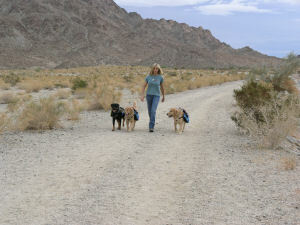 Pictured below, Lauren at sheepherding with one of her dogs and hiking with three of her dogs. Lauren Warshaw, owner and stylist, was born and raised in a North Shore suburb of Chicago, IL. An animal lover since she was born, she had many different pets growing-up, trained the family dogs and rescued everything from one-eyed rabbits and frogs to injured birds, even insects were saved and released outside. Lauren graduated from the University of Miami in Coral Gables, FL, on the Dean's List, with a Bachelor of Science Degree in Communications. She double-majored in psychology and advertising. Little did she know then, that her interest in psychology would end up being in both humans AND dogs! Lauren lived in many cities across the US and she had many different career choices over the years, primarily in television production, the restaurant business and sales. She was a highly successful, educational sales rep for almost 10 years both in Chicago and Los Angeles before leaving her job and selling her home in the South Bay to do what she truly loves --- spending time with the dogs! She then worked for a few months in the kennels at Guide Dogs of the Desert and that really confirmed to her that she wanted to have a doggie business. 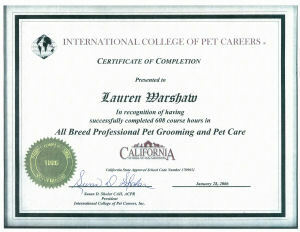 In 2005, Lauren attended one of the top dog grooming schools in the country, California School of Dog Grooming, for 608 hours. She graduated in the prestigious Director's Circle and also earned the highest score ever in the history of the school on her comprehensive final exam (99.5%). It is very important to make sure that the dog groomer you choose for your dog has been educated at a certified school and not only in grooming technique, but also in saftey, kennel management, anatomy, sanitation, dog handling, business and much more. It is also very important to choose a dog groomer who has a vast knowledge of dog behavior. Understanding the way dogs think and how to handle them is one of the most important aspects of grooming. 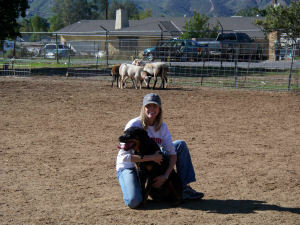 Club Doggie is licensed and insured, and Lauren has completed two Pet First-Aid/CPR classes and earned her certificates.